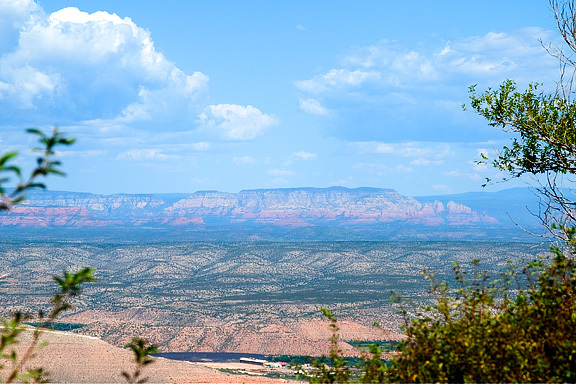 On Friday, I visited a small town	in	Central Arizona that was founded on mining — primarily copper mining. You can see the "J" on the hillside denoting Jerome. Native Americans were the first to discover the colored stones, such as malachite, that are rich in copper. Inevitably, the Spanish came seeking gold but it was the Anglos who really began to develop the rich copper deposits that were hiding beneath the hills here. 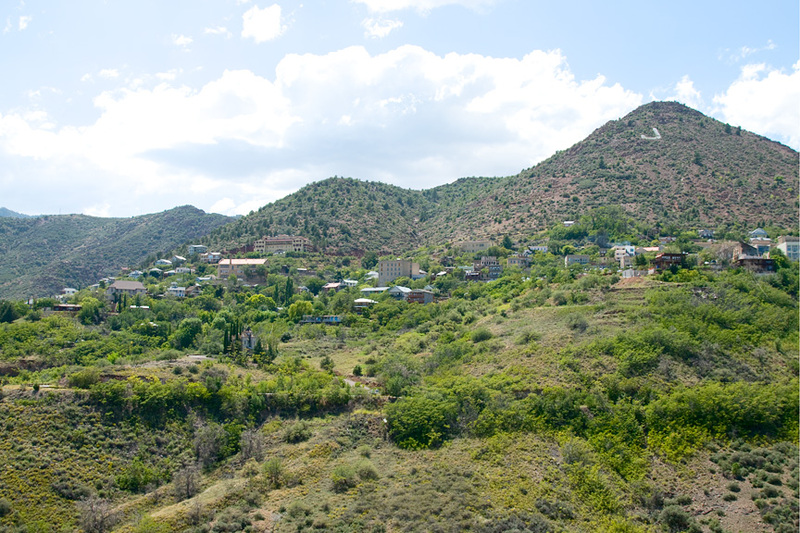 Mining operations began in the 1880s and the town grew rapidly. Workers from all over the world came to work the mines resulting in a cosmopolitan mix of Americans, Mexicans, Croatians, Irish, Spaniards, Italians, and Chinese. The town was built on the hillside with the main street following a switchback route. Eventually,	the	mines	played out and the workers left — and the population dwindled to only 50 people. 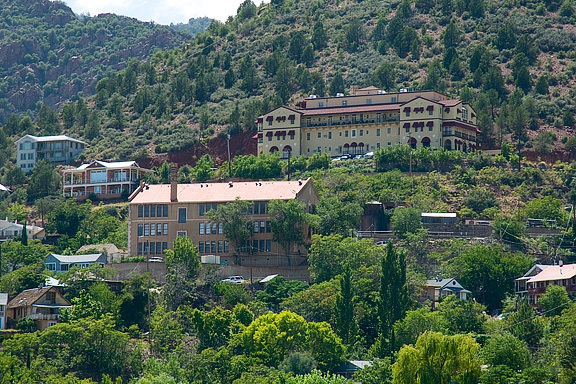 Fortunately, the Jerome Historical Society guarded the empty buildings against vandalism and the elements. 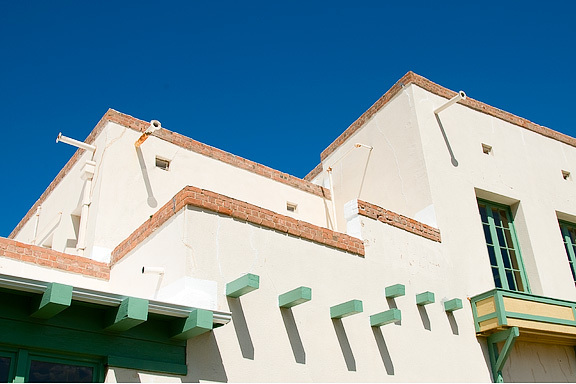 During the 1960s and 1970s Jerome became a haven for artists which brought the town back to life. In 1976 the entire town became a National Historic Landmark. Currently, the town is alive with writers, artists, artisans, musicians and historians resulting in a colorful and thriving community which is delightful to visit. 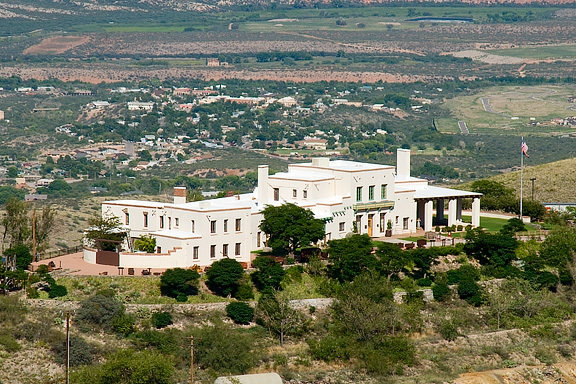 One of the prominent structures in Jerome is the Douglas Mansion, built in 1916 by James Stuart Douglas, Jr. also known as "Rawhide Jimmy". His family had been working, investing and managing the mining industry for years when he became involved in mining in Jerome. It was the Little Daisy Mine which was an extraordinarily rich find that became his "baby". 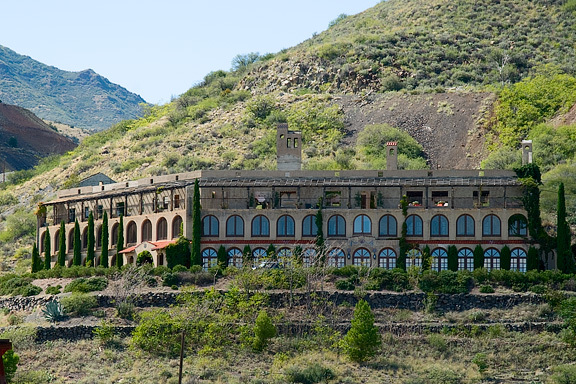 Curiously, he built his mansion on a prominent hill right next to the mine. It featured a wine cellar, billiard room, marble shower, steam heat and a central vacuum system — the latter very much ahead of its time. In 1965, the Douglas Mansion became a state park and museum. 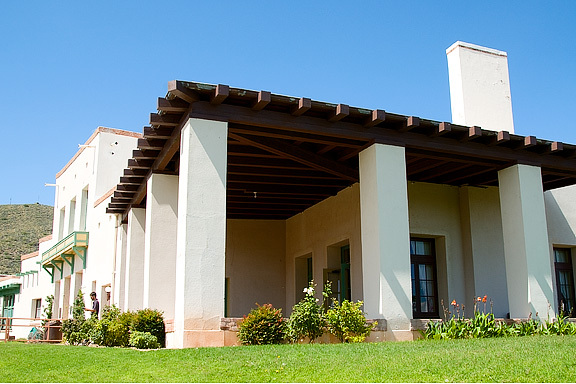 The	walls were constructed of adobe brick, made on site, and is one of the largest adobe structures in the country — some 8700 square feet of floor space. Most of the furnishings have been removed so the rooms can contain display cases and other exhibits. Some of the exhibits are quite interesting. One was a nugget of copper ore the size of a basketball — remarkable not just for the size but for the 58% copper content — since most ores consist of single-digit percentage of the target metal. Another noteworthy exhibit was a three dimensional map of the underground mine — it resembled an ant nest. Connected	to	the	main house was a carriage house with Rawhide Jimmy's horse-drawn carriage. 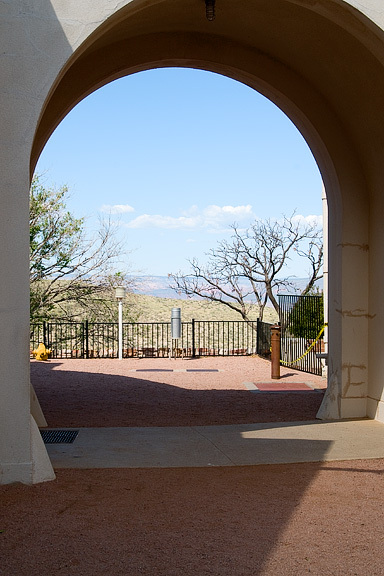 The archway would protect him from the elements but now provides a nice framing for the view of the valley below. And how about that view?!! 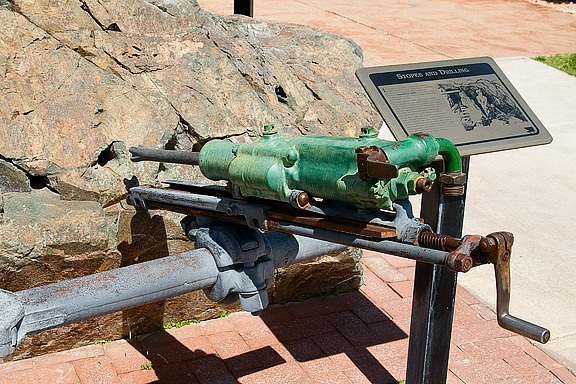 Also on the grounds of the mansion, there are artifacts from the mining operations. 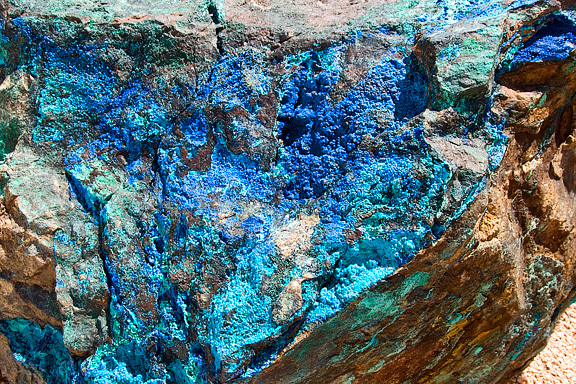 Here	is	an example of copper ore — displaying the bright colors that are common with copper compounds. 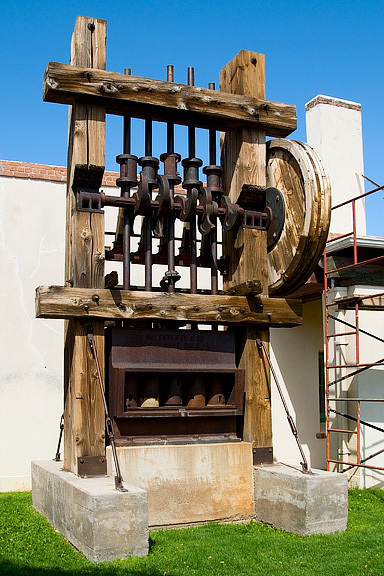 This is a mining drill	used	to	help	split the rock into sizes that could be fed to a crusher. 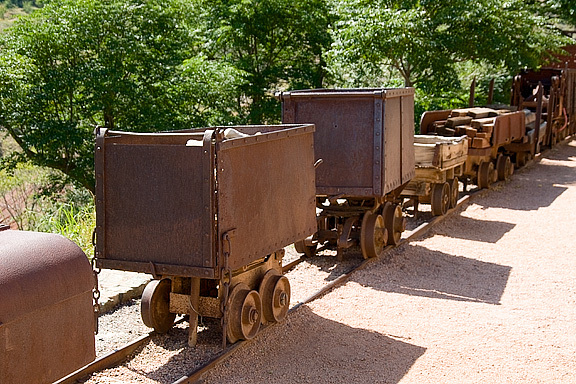 Once the rock was	broken	off,	it	would be placed in a mine train and taken to the elevator to lift it to the surface. Here we find a rock	crusher	— a more modern model. Older ones on display were simply big rocks that were dragged over the ore and large millstones that were rolled over the ore — both powered by animals. Just below the mansion were	the	openings	to	the Little Daisy Mine. 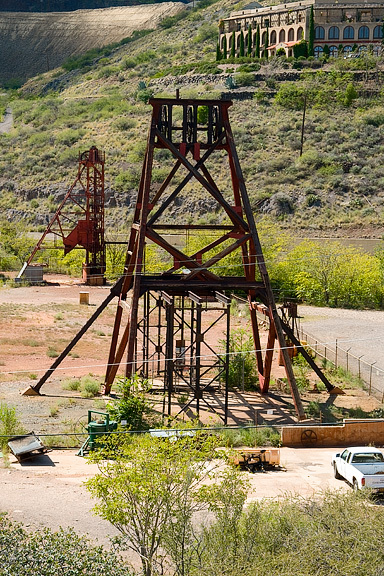 The one in the foreground is the historic Audry Headframe. Built in 1918, it is the largest wooden headframe still standing. The one in the background is the Edith Headframe. As the mine was excavated, a cross-shaft was dug between the two vertical shafts at every 100 foot level from the surface. 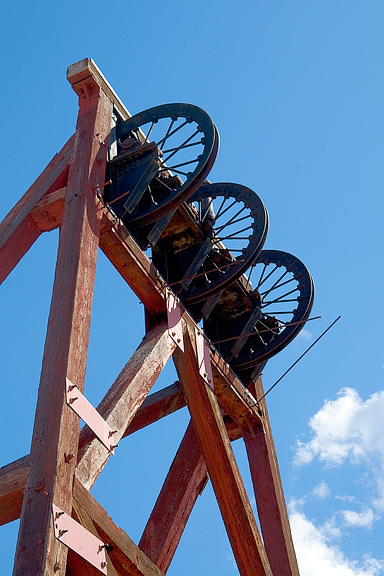 We close	with	a	close-up	of the Audry Headframe.